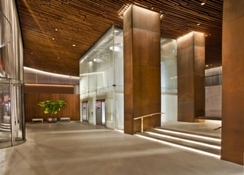 Row NYC is a boutique hotel inspired by the city it inhabits. Located in the Theatre District and only a few minutes to Times Square, this hotel offers great views of the bustling heart of NYC. In its colour scheme and interiors, guests can find subtle homage to the Big Apple and the hotel makes sure they feel at home with modern guest amenities and warm, unobtrusive hospitality. Housing Times Square’s only food market, City Kitchen, guests have access to classic NYC dishes gathered from all corners without having to travel the distance. With a fitness centre, business centre and helpful concierge service, guests can have information and arrangements for fine dining, shows, transport and other services in this iconic city. 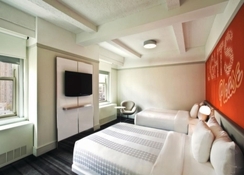 The hotel is located in the Theatre District a short walk from the Times Square and Rockefeller Centre. Iconic NYC landmarks such as Madison Square Garden, Radio City Music Hall, the Empire State Building and Javits Convention Centre are all within 15 minutes’ walk. The JFK International Airport is about 26km. 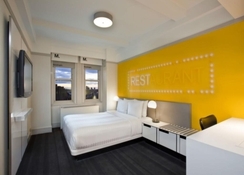 Row NYC has intimate and sophisticated guestrooms spread across its 28 floors to suit every taste and requirement. 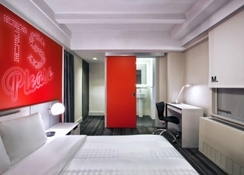 The contemporary rooms feature an iPod docking station, a flat-screen cable TV and safe for a laptop. Fine linen, blackout curtains, PURE bath amenities and a desk are also included. The rooms come in categories like Standard, Superior, Deluxe City View, Premium City View, Executive Suites and Penthouse Suites. Row NYC is home to two iconic Times Square dining landmarks. The District M Bar at lobby level serves a daily continental breakfast each morning and alcoholic drinks/beverages in the evening. The City Kitchen food market brings together several city delicacies all under one roof for guests to try. It has iconic eateries like Azuki, BOX, Dough, Gabriel’s Taqueria, Kuro-Obi, Luke’s and Whitman’s selling their delicious offerings made from the freshest ingredients prepared by expert chefs. 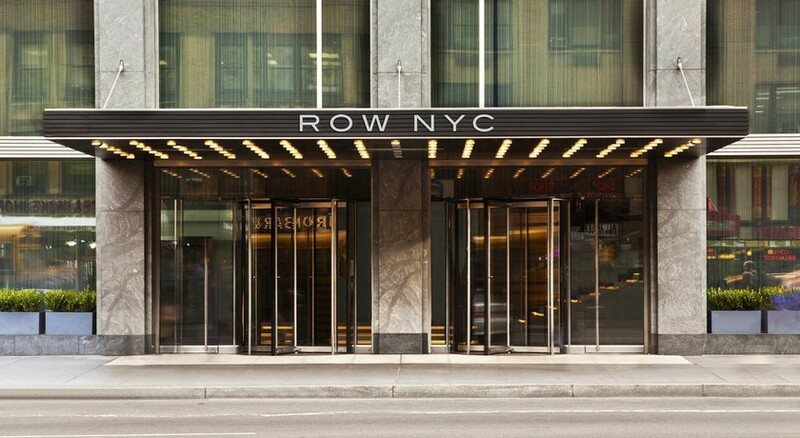 Located in the Theatre District, guests at Row NYC are never too far from recreation and entertainment. Step out of the hotel to enjoy lively entertainment at the iconic theatres and be sure of a reservation through Row NYC’s ticket service. The District M Bar is an excellent place to relax with a drink in the evening; the bar also hosts lively entertainment. 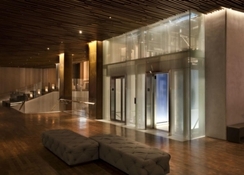 Guests who wish to stay active during their NYC break can head to the fitness centre. The neighbourhood is very close to renowned shopping and dining destinations should the guests wish to indulge.